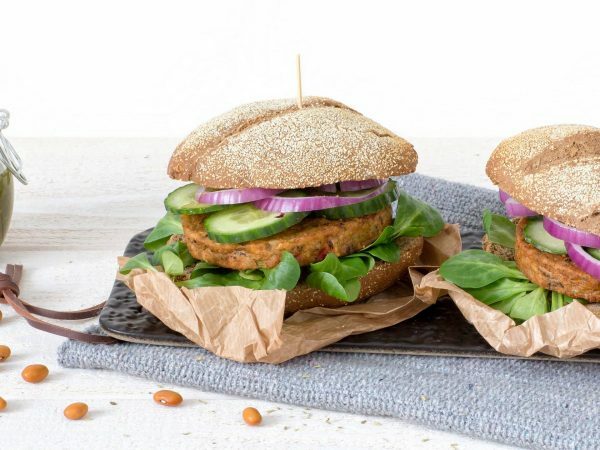 This vegan Bean Burger is a deliciously spicy burger full of veggies that uses pea protein as a base. A bean burger weighs about 80 grams and contains no milk, egg or soya. This product is therefore suitable for vegans and people who are struggling with a soya allergy. Water, broad beans 20%, vegetable protein 13% (wheat gluten, potato), brown beans 9%, fine green peas, red sweet pepper, onion, sunflower oil, starch (potato, wheat), tomato paste, herbs and spices, salt, mineral (ferrous fumarate), vitamin B12. Produced in a facility that processes peanuts and nuts. Frying pan: 4-6 minutes on moderate heat. Turn every now and then. Oven: 5-7 minutes at 180°C. Turn once. Microwave: 1 minute on 900W. Barbecue or grill: Rub with (olive) oil. Grill on both sides for 2 minutes.